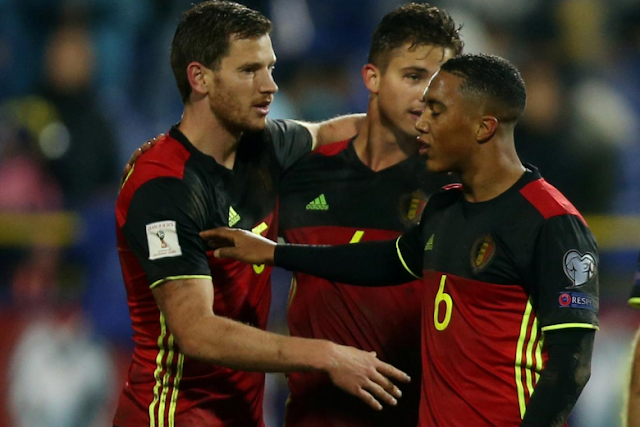 2018 World Cup Qualifications - Europe - Bosnia and Herzegovina vs Belgium - Stadium Grbavica, Sarajevo, Bosnia and Herzegovina - October 7, 2017 Belgium's Jan Vertonghen and Youri Tielemans celebrate after the match. SARAJEVO - Belgium kept their unbeaten World Cup qualifying record intact after they took the lead and then came from behind in a 4-3 win at Bosnia on Saturday which dented the Balkan nation’s hopes of reaching next year’s finals. The outcome also sent Italy through to the playoffs as one of the eight best runners-up. The result left the Belgians, who had already qualified for the 32-team tournament in Russia as winners of Group H, with 25 points from nine games, 11 ahead of second-placed Bosnia who now have only a slim chance of clinching a play-off berth. Third-placed Greece, who have 13 points from eight games, can move above the Bosnians into the runners-up spot when they visit Cyprus later on Saturday. Wing-back Thomas Meunier fired Belgium ahead in the fourth minute with his fifth goal in six games, sweeping in a fine cut-back by Eden Hazard on a muddy pitch at Grbavica stadium. The Bosnians piled on the pressure after falling behind and hit back through midfielder Haris Medunjanin and winger Edin Visca to turn the tables before halftime. Medunjanin equalised on the half-hour with a close-range finish after he was set up Edin Dzeko and Visca rifled in a fierce shot from 14 metres nine minutes later after a calamitous error by Belgium defender Jan Verthongen. Striker Michy Batshuayi equalised from three metres after Bosnia goalkeeper Asmir Begovic could only parry a sizzling low shot by Yannick Carrasco on the hour before Verthongen made amends for his mistake with a simple finish. The centre back volled home at the far post after a corner was driven into his path by Carrasco, silencing the passionate home crowd on a rainy night. Defender Dario Djumic rekindled Bosnia’s hopes with a thumping 82nd-minute header, only for Carrasco to score less than a minute later, when he took advantage of sloppy defending to steer the ball past Begovic. Bosnia must beat Estonia away in their final game on Tuesday and hope that other results go their way in order to keep alive any hopes of progressing. Europe’s nine group winners qualify automatically for the World Cup while the eight best runners-up enter a two-leg playoff for the remaining four berths. Belgium kept their unbeaten World Cup qualifying record intact after they took the lead and then came from behind in a 4-3 win at Bosnia on Saturday which dented the Balkan nation’s hopes of reaching next year’s finals.